“Located at 29 Victoria Street, Hamilton, the office is now writing business and will be headed up by Chris Fisher, a Bermudian underwriter with 25 years of experience in Bermuda, the US and the UK,” the company said. “Prior to joining Neon he was Chief Underwriter of Insurance for Ariel Re in Bermuda where he worked for 9 years having helped to found Ariel’s insurance team. “Chris has also worked for ACE in various senior underwriting and executive roles and started his insurance career in Bermuda with BF&M General Insurance Company. Further to Chris’ appointment, Neon also anticipates making a number of local hires as the office expands. “Chris will initially be writing direct and facultative property insurance on a global basis as an approved coverholder for Lloyd’s Syndicate 2468. Business will be considered on a primary, quota share and excess of loss basis with critical catastrophe line sizes up to US$10m and fire capacity up to US$25m. Chris Fisher, CEO Bermuda said, “I’m delighted to be joining Neon to open and lead its new Bermuda office. 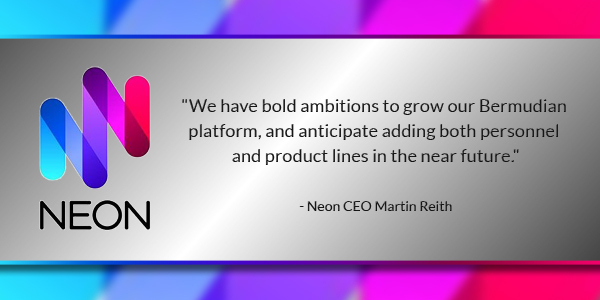 Martin Reith, Chief Executive Officer, Neon, commented, “Opening the Bermuda office is a strong statement of our intent to expand Neon’s international presence and grow the business. “In Chris, we have a highly regarded local underwriter with strong relationships on the Island, as well as in the US. We have bold ambitions to grow our Bermudian platform, and anticipate adding both personnel and product lines in the near future. “More broadly, opening in Bermuda, which follows the completion of our strategic review, is a further sign of the momentum within Neon as we continue to make encouraging progress with the strategic turnaround of the business. Great news. Wishing you lots of luck.